As the fourth quarter results keep coming in and the annual general meetings (AGMs) follow in the coming months, the question of what role should an independent director (ID) play in the conduct of the meetings remains alive— what with the perception having gained ground in the wake of the Satyam fraud that IDs did not do their jobs properly. The key question then is: Have things changed in the boardrooms? Companies are certainly waiting a few days extra to put out the audited results. But has the relationship between the management and the IDs changed? “Absolutely not,” says Deepak Satwalekar, former MD of HDFC Standard Life and now independent director on the boards of six companies including Infosys and Tata Power. “But then my views may be biased, because I am as independent as I want to be.” The point here is that the companies in which the IDs get the freedom to work independently are the ones which are, in any case, well-governed. However, well-functioning boards are more the exception than the norm, as the spate of resignations by IDs in the wake of the Satyam episode as also the Nimesh Kampani case go to show. But should IDs take all the blame? Former cabinet secretary and ambassador to the US Naresh Chandra, who chaired a committee on corporate governance a few years ago, believes that as an overreaction to Satyam there has been an unfair witch-hunt of sorts. “If someone thinks that an ID is a detective inspector with a spy glass and can prevent fraud then that person should have his head examined,” says Chandra. Satwalekar, too, believes that forensic skills are certainly not essential qualities for IDs. “Good corporate governance is not possible if the CEO of a company does not want it,” he puts it bluntly. As per law, regulation enforced through Clause 49 of the Listing Agreement makes it mandatory for listed companies to have at least a third of their boards made up of IDs. 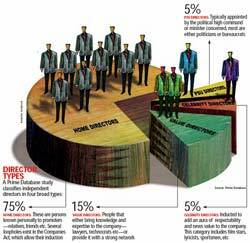 They are expected to function in a fiduciary capacity protecting the rights and interests of the minority shareholders. But according to Prithvi Haldea, Managing Director of Prime Database, the adherence to Clause 49 is mostly in form and not in spirit. Mostly, the IDs are neither independent nor are they competent to actually keep a check. Yet, what should the IDs be rationally expected to do? Besides their regulatory role as a watchdog for minority shareholders, their oversight extends to items where there is a potential conflict of interest, especially in related party transactions. So, much is certainly expected of them. But given that they are appointed and paid by the management, is it realistic to expect them to bat for the mythical minority shareholder? “It is clear that the system does not deliver in its present form,” says Bibek Debroy, who is on the board of two unlisted firms. That begs the question: Can we fix the institution of IDs to deliver what we expect them to do? Post-Satyam, there have been suggestions regarding the appointment, payment and mandate of IDs. Most are quite impractical including foisting outsiders as IDs. Says Omkar Goswami, who is on the board of seven companies including Infosys, IDFC, Ambuja Cement, and Godrej Consumer Products as ID: “Apart from the IDs and others who hold fiduciary responsibilities, in a well functioning market there should be dogs that bark.” And those barking dogs could well come from institutional shareholders, financial media or whistle blowers from within the companies. Add to that the less than rigid benchmarks set forth by the government as a majority shareholder and promoter. Consider this: The Gujarat government expects all profit-making public sector units in the state to compulsorily contribute up to 30 per cent of their annual profit before tax to the Gujarat Socio-Economic Development Society (GSEDS) set up by it to support the weaker sections. Minority shareholders in the national oil marketing companies, too, are never consulted when these firms bear the brunt of rising crude oil prices. And if the companies’ job is to do business and earn profits then they should be allowed to do so in as unfettered manner as possible. And the mechanism of IDs just provides an expensive illusion of some comfort in what is essentially the risky world of equities. “Maybe it is time to bury the concept of IDs,” says Haldea.